As of Fastcall v6.0.2, these settings are split between the Fastcall Settings app and the ‘Goal’ tab in Salesforce. Unfortunately, some properties of the Goal can only be set by editing the Goal records directly. The settings for Goals are found under Fastcall Settings > Admin Settings > Call Goals > Goals. The table here allows you to filter your goals, create, edit and delete them. In order to use Records of any given Object for this Goal, the Object must be set as a Managed Object in Fastcall Settings > Admin Settings > Call Handling > Managed Objects. See the training module about Call Logging to understand more about Managed Objects. Accomplished Criteria – If a particular Call Result is recorded, or the record related to the Call has a field changed to particular value, the Goal Snapshot can be set as ‘accomplished’ even though the count of calls has not been met. For example, converting a Lead should count as a met Goal, even if it took 1 call instead of 7. Progress towards Goals is measured by the count of connected outbound calls. Inbound calls, and calls that do not get answered, do not count. When the count of calls reaches the Objective set for the Goal, it is accomplished. In addition, Goals of type ‘Call Count per Record’ can be accomplished early if a particular Call Result is recorded or if a field on the Record is set to a particular value. Fastcall stores progress towards Goals as Goal Snapshots. There will be one snapshot per Goal per period, and each completed Call will increment the ‘value’ by 1. If the ‘goal’ is met before the period end, the status will change to ‘accomplished’, otherwise it will change to ‘failed’. 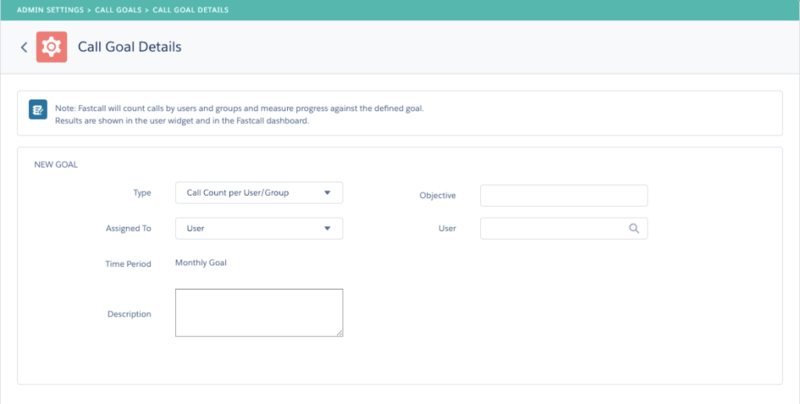 For Goals of Type ‘Call Count per Record’, one Goal Snapshot is created per Record attempted – the Goal Snapshot does not exist until a Call is made to the particular Record.